Only used a few days end of 2018 pumping season! Folds up enough to pull hose reel off drawbar with this on quick hitch. Dealers for all Cornell High Pressure Pumps. We Have a large variety of pumps on hand at all times! Only used for 30 acres, customer needed higher amounts spread on field than originally anticipated. Needed to use a grain drill so wouldn't have to re-fill all the time. 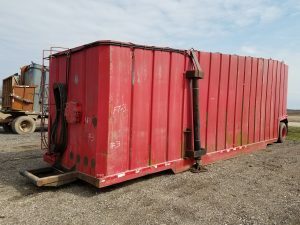 New Unit retails for $13,000.00. Top of Spout to Ground is 9'10"
Dual Wheels allow for driving down diagonal of field to get hose over for final pass for complete coverage and not missing the longest pass. Folds up nicely on quick hitch that hose reel can also be hooked up to drawbar. Gaskets, Locking Clamps, and entire hatch. Dual Manholes in top of tank. Equipped with electric Stirring mechanism. If you have larger Valve we have up to 20" Flanges to mount this splash pan on. Air Cylinder Sold Complete W/ Valve Or Separately Solenoids Can Also Be Sold Separately We Have Flanges, Pipe, Fittings, Etc. We Can Set Up To Whatever Your Needs May Be! Just Stop In Or Give Us A Call! Equipped with 3rd Axle Mounted TIght. Tires are in very good shape, all around 75% life left. front axle has a bit less. Back Door Pivots on Top. Tires are in very good shape, all around 75% life left. 1/4 Thick Plastic Liner, As you see in the picture the back door seals very well. Year- 2018. Only Used for Fall Pumping! 2 Point Pick-up Hitch Allows for Superb Control in Transit and dump site placement. Flotation Tires are like Brand New, Entire Unit is like new. Self Priming with minimal liquids in dumpster. 2" Green Hard Hose is what allows for automatic priming. Spring Return Hook-up to prevent too much down force on rubber scraper. Adjustable back stop on bottom of scraper to add strength to scraping edge. Outside is in very good condition. Male End on end of fillpipe to add strength in case something runs into it. Sold With Verification of Calibration print out sheet. 10" Outlet With Hydraulic Valve Recessed In Tank For Minimal Width. 8" Inlet Pipe Set Up To Self-Agitate Tank To Reduce Sand Settlement. Hydraulic Cylinders synced with wet kit hookups for self hook-up. We have all the adapting fittings you may need available right here. Tank is in very nice condition. Tapered Roof allows for more storage and a shorter length trailer, When hooked up to truck the roof is parallel with ground. 8” Inflow piping, comes in from top and disperses on bottom rear toward front for in tank agitation while pumping. Hydraulic Cylinders on each side for ease of pickup and transport from locations. 20" Manways in front and rear of tank. 4-4" Butterfly Valves in front. we have all the adapting fittings you may need available right here. There is a little staining on inside on paint. Appears to be a grease or fatty substance. We Can Set Up However You Like, Several Units Available! Call! Inside has what appears to be like a fatty or greasy substance inside. Holds up to 8 lengths of 8″ Hose plus Drags or 9-8" Hoses. This reel was used very little in the 2018 season as seen in pictures. This Reel holds 10 lengths of 6" hose. Holds 10 lengths of 6” Hose. This is one of our units we have run and maintained since new. Pumped all liquids, NO SAND. Stored indoors most of the time. Approximately 60 Million Gallons went through unit. Holds up to 8 lengths of 8″ Hose plus 2 drags hoses. Hose Capacity~1 1/8 Miles of 10" Hose ~ 2 1/8 Miles of 8" Hose. Model D2 30A Engine Drive, NOT Turbine Drive. Center Pivoting Reel to roll with Reel turned sideways. Holds 4 to 5 6" Hoses, 3 IN STOCK! Heavy Duty 3" Spindle Assembly. "auto-Reel" Gear Box With Powered Roll, Unroll And Neutral Positions. Tandem Axles With 445/65 R22.5 Tires. Single Axle With 445/65 R22.5 Tires. Trinovation 3 Point Hose Reel Capacity: 3 Lengths Of 6" Hoses Hydraulic Motor Drive With Direct Gear Coupling. Rounded Edge On Drum Hole For Protecting Hose. Come Check It Out Along With Our Huge Inventory Today! Rounded Edge On Center Drum Hole For Hose Protection. Ends not included but available. 2 Splices where Plus Symbols are above. No Menders in this section. No Ends included but available. Hose will be rolled on a spool for customer pickup or can be picked up with hose reel. Whichever way you prefer. We have a variety of used hose here from 6" to 10". Give a call to come check out the selection and pricing on the specific hose of your interest. Completely Gone through Shop and Field Ready! Flowmeter Sold Separate- Can be Sold with the flowmeter for extra if still available at purchase. Unit is in excellent condition, fully serviced, and is field ready! We are using this unit for 2019 season but can sell anytime throughout season. 6" Krohne Flowmeter. not included. Price for the unit is for as pictured. Can be fixed up and checked over by our shop for an extra $2,500.00. Needs a few springs and shovels replaced, flowmeter read-out screen is has hole in it, 1 Gauge wheel is missing tire. Bolt on swing tube for attaching with ease. Accurate Application with 4 splash pans spreading in front of the discs evenly spaced. Hydraulically run 6" Trueline Valve w/Resilient Seat for superb sealing. 23" notched discs built to last! This is our Demo unit. Call to come Rent it or purchase. Debris blocking up your high pressure pump or injector bar? Here's the cure! Place this chopper between your feed pump and high pressure pump. Holes in unit are sufficient enough to take up to 10" hose. This is one of our engine units we have in use. New Wear Ring installed in suction cover, impeller and housing show minimal wear. 4" Male Camlock Outlet w/ valve for flow stop. Needs 50 HP to run. Arms extend to spread from 30'-60' Spread Width. Flowmeter Slot but not included. As Always all of our used equipment is sold all gone through shop and field ready!! 10" Suction Pipe beside housing, Run Pump to prime unit with 10" Valve Closed. When High Pressure Pump is Primed, Open Valve and Shut pto off. This unit is sold all checked over and ready to go to work. Installed our Phil's 1/2" AR400 Plate Housing, 1/2" AR 400 Plate Impeller and Heavy Duty 2 1/4" Bearing Tube on rear of pump. Tanker Barrel is in good condition. Completely Gone through and serviced. Under Carriage is in nice condition also. Tank is sold as is for this price or we can mount a pump on it if you don't already have one for additional cost. Equipped with hydraulically operated brakes on 2 front wheels which have little to no wear. Tanker is sold completely serviced and field ready. 36" manhole on rear for easy cleanout of rocks and other debris. Aftermarket LED Lighting installed on rear of tank. -30 inch top fill port w/extender on it to make easy to see top port backing under fillpipe. Tanker is flushed at the end of manure season to slow down rust penetration and clear out debris for thorough inspection. Unit is sold all completely checked over and approved for another manure season. 5 Brillion Shanks w 14" sweeps equipped with 3" Injector tubes and hoses. Yellow Quick Handle not included. Impeller And Double Volute Housing Constructed Of Ar400 Steel. Will Build For Your Specialized Application. Up To 4,500 G.p.m. Agitation Capacity. Loading Capacity- Up To 2,500 G.p.m. Tanker is all D.O.T. inspected and field ready ie. wheel bearings, bushings, all suspension components are checked over and field ready. Travis Snap Clamps on rear discharge pipes. 2-12" Transfer Tubes-Aluminum with Travis quick snap clamps. 20" Manhole in front of tank to flush any sand that would happen to get built up in tank. 12” Splash Pan-Aluminum & 2 Transfer Tubes-Aluminum with Travis quick snap clamps. Unimount / Straight Hole Wheels / 4 are aluminum. 4" Male Camlock out rear of tank after Valve. Man Hole in front for flushing the sand build up out simply by running fillpipe in front on tank and draining straight out rear. DOT Inspected and Field Ready!!! Aluminum Splash Pan and Aluminum 90 Degree Transfer Pipe Included. Smooth Bore, Straight Barrel, No Baffles. New Nose Box on cap of tank. Dual 12" Trueline Valves with Travis Quick Clamped Aluminum Pipes and Travis Quick Clamp Aluminum Splash Pan. Manhole moved to furthest point on top of tank for superb flushing out of tanker if sand build-up. D.O.T Inspected and stickers run along side of tank. Stainless Steel Barrel and Rings beneath outer sheeting. Steel Running Gear Frame and Steel Landing Gear Frame. Shortened Frame, We remove all bolts from frame rails and move entire running gear forward and cut excess frame off. Pictured Leather Seat is removed and stock seat is in. 5" Rear Cab Bump Out kit w/window installed and painted to match truck. We have owned since 2007 and just looking to update our fleet. Truck is fully serviced and maintained very well, from Engine, transmission, exhaust etc. everything is in good condition.